Hello everyone! Today I have a easy Easter card to share with you. I used the cute chick digi stamp from Polka Dot Orchards new EGGS-tra Special Easter digi set. I absolutely love the style of this chick, I really like the thick bold sketchy lines. And what about those little ladybugs, aren’t they just adorable? 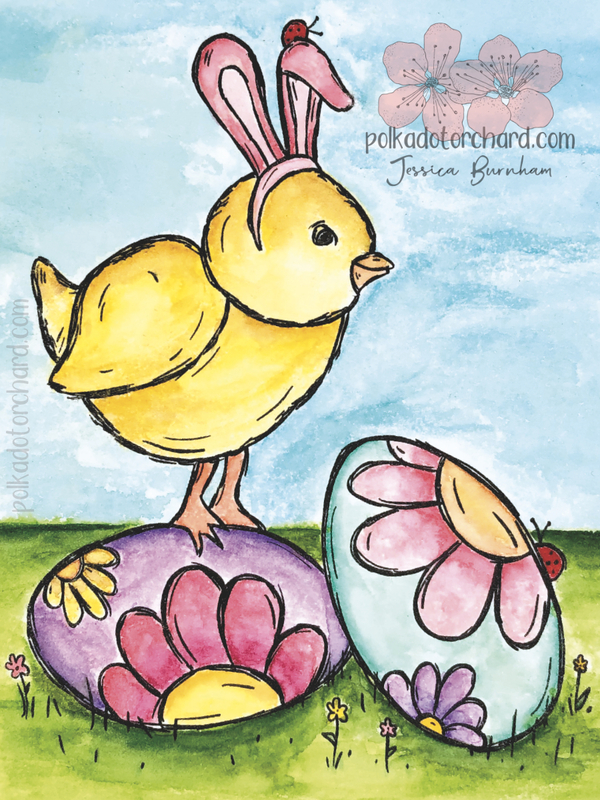 I printed the Easter chick on 90 pound watercolor paper and painted it using Prima Watercolor Confections. I then cut my watercolored panel out using a Honey Bee Stamps Stitched Scalloped Die. I absolutely love their dies, they are nice and big and of course perfect for an A7 size card. I kept it pretty simple, by just layering it on top of some coordinating pattern paper. I thought adding a sentiment to the front was just a little too busy so I punched the word HELLO out and colored itwith some Tim Holtz Mowed Lawn Distress Ink and then attach the letters to my card front. Pretty easy, right? I just love the sentiment I used on the inside. That saying is perfect and the use of different fonts adds just the right whimsical look. I printed this sentiment on some Neenah 110 pound cardstock and cut it out using a Whimsy Stamps Stitched Oval Die. I layered it with the same pattern paper I used on the front of the card. It needed just a little bit more so I used some itty bitty heart dies and my scraps of watercolor paper to cut hearts out that matched the card front and attached them to the inside. Now, before you go what do you think of this new Bee Hoppy digi stamp set? I just released it the other day. With Easter being right around the corner I decided to put it on sale as well as the rest of the Spring time sets. Make sure to grab them at that price while you can. 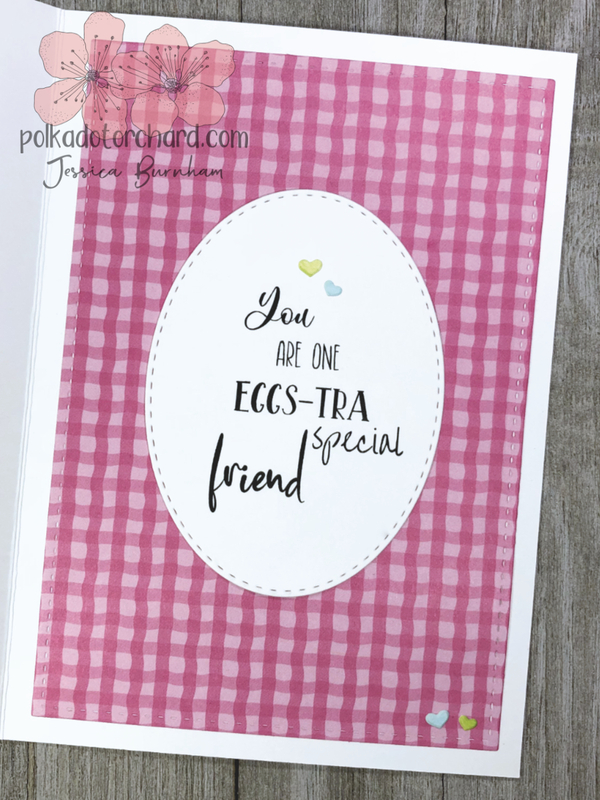 Also if you haven’t joined the Friends of Polka Dot Orchard Facebook group please do so and make sure to share your PDO crafty creations I would love to see them. If you share on Instagram don’t forget the #polkadotorchard. Thanks for visiting today and happy crafting.